The little linter that could has grown up before my eyes. In the two and a half years since ESLint was introduced, its popularity exploded. This past month, we surpassed 1.5 million npm downloads in 30 days, something I never thought possible back in the day when an average month of downloads was 600. And all of this happened while I’ve been extremely ill with Lyme disease and barely able to leave my house for the past two years. That meant I couldn’t go to conferences or meetups to speak about ESLint (the previous two years I was a conference regular). Yet somehow, ESLint gained traction and has continued to gain in popularity. I think it’s a good time to look back and try to understand why. ESLint, on the other hand, had a very big advantage: you could swap out the default parser for another one so long as it produced the same format as Esprima (or Espree). That meant those who wanted to use ECMAScript 6 could use the now-discontinued Facebook fork of Esprima with ES6 support immediately to get some basic linting for their code. Espree was also updated to support ES6 (mostly by pulling features from the Facebook Esprima fork). That made developers using ES6 quite happy. Before long, ESLint was the recommended linter for anyone using ECMAScript 6 or Babel, and it was made possible by a decision to allow the default parser to be swapped out for a compatible one. Today, babel-eslint is used in roughly 41% of ESLint installs (based on npm download statistics). There were a lot of requests to create React-specific rules in ESLint itself, but as a policy, I never wanted library-specific rules as those would inevitably require a lot of maintenance. In December 2014, eslint-plugin-react5 was introduced with React-specific rules and really caught on quickly with React developers. If you haven’t heard of it, ESLint is the linter I always wanted JSHint to be. Dan also walked people through setting up ESLint and how to use babel-eslint, providing some much-needed documentation for the process. It’s pretty clear to see that this was a big turning point for ESLint as the monthly download count nearly doubled from 89,000 in February 2015 to 161,000 in March 2015. That really seemed to kick off a period of rapid growth for ESLint that has continued to this day. Today, eslint-plugin-react is used in a bit more than 45% of ESLint installs (based on npm download statistics). You can add new rules at runtime, allowing anyone to write their own rules. I saw this as key if I wanted to avoid spending every day with a laundry list of random rules people wanted. Now, there’s nothing stopping anyone from writing an ESLint rule. The pluggable parser means that ESLint can work with anything outputting the same format as Espree. As I’ve already discussed, this has been a big reason for ESLint’s popularity. Shareable configurations all people to package up their configs and share them, making it easy to have multiple projects adhere to the same configuration (eslint-config-airbnb is used in 15% of ESLint installs). Plugins allow people to easily package and share their rules, text processors, environments, and configurations with anyone. A rational Node.js API that made it easy to create build tool plugins (for Grunt, Gulp, and more) as well as led to the creation of no-configuration linters like Standard and XO. I’m hoping we can add more extension points to ESLint as it continues to evolve. The pluggable parser feature - a direct request from Facebook so they could use their own fork of Esprima with ESLint. JSX support - early on, I was very against including JSX support by default. But the request kept coming up, so I eventually agreed. And as mentioned earlier, that has been a key part of ESLint’s success. Shareable configs - this came about due to the emergence of Standard and other wrappers around ESLint whose sole purpose was to run ESLint with a specific configuration. It seemed like the community really wanted an easy way to share configs, and so shareable configs were born. Plugins - early on, the only way to load your own rules was from the filesystem using the --rulesdir command line option. Pretty soon, people started packaging up their rules into npm packages and publishing them. This was a bit of a painful process, and it was hard to use more than one package at a time, so we ended up adding plugins so that rules could easily be shared. It’s pretty clear that the ESLint community has some fantastic ideas for how the project should grow, and there’s little doubt that ESLint’s success is directly to them. Since ESLint was created, I wrote exactly two blog posts about it. The first was the intro post on my personal blog2 and the second was a followup on Smashing Magazine7 last September. Other than that, the extent of my marketing for ESLint was limited to mention it on Twitter and managing the ESLint Twitter account. If I had been well enough to give talks, I’m sure I could have done a better job marketing ESLint, but since I wasn’t, I decided that I wouldn’t even try to promote it. I was pleasantly surprised when I started seeing other people giving talks and writing articles about ESLint. In the beginning, it was people that I didn’t know and had never heard of. Articles (such as Dan’s) were popping up and people were posting videos of conference and meetup talks about ESLint. The popularity grew organically as more content was posted online. 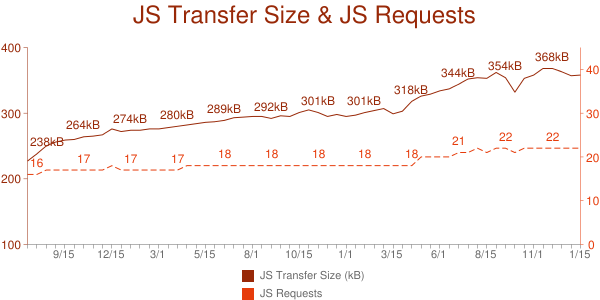 An interesting contrast is in the growth story of JSCS. Early on, JSCS got JSHint’s endorsement as a companion to JSHint. JSHint had decided to remove stylistic rules altogether and JSCS serves as a replacement for those rules. As such, the JSHint team was referring people to JSCS when questions arose. Having the support of the undeniable leader in the space is huge, and for most of the early days, JSCS usage far outpaced ESLint usage. At several points during that first year, I thought that JSCS would crush ESLint and I could go back to having my nights and weekends free. But that didn’t happen. The strong grassroots support sustained ESLint and eventually helped it onto a tremendous growth spurt. Users were creating more users and more buzz, and ESLint was along for the ride. I’m not trying to convince you that ESLint is better than JSHint. The only thing I know is that ESLint is better than JSHint for what I’m doing. In the off chance you’re doing something similar, it might be better for you. Otherwise, keep using JSHint, I’m certainly not going to tell you to stop using it. That’s been my position, and now the position of the team, all along. I still believe JSHint is a good tool and has a lot of advantages. JSCS, as well, is a good tool that has some real benefits. Many people use a combination of JSHint and JSCS and are quite happy, and for those people, I’d encourage them to continue doing so. The focus of ESLint is really just to be as useful as possible and let developers decide if it’s right for them. All decisions are made based on how useful changes are to our community and not based on competition with other tools. There’s plenty of room in the world for multiple linting tools, there doesn’t have to be just one. I’ve mentioned before8 that there seems to be a frantic race to create popular open source projects, with a focus on popularity over everything else. ESLint is a good example of how long it takes for a project to organically grow into a success. 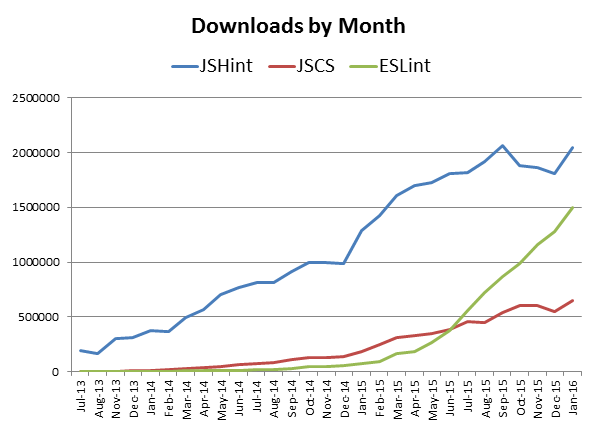 For the first nearly two years of its existence, ESLint downloads were a distant third behind JSHint and JSCS. It took time for both ESLint and its community to mature. The “overnight” success of ESLint didn’t happen over night, it happened by continuing to improve the project based on usefulness and community feedback. I’ve been truly blessed with a fantastic team of contributors to ESLint. As I’ve had less energy and time to work on ESLint, they have picked up a lot of the slack. The thing that amazes me constantly is that I’ve never met these people in real life, nor have I ever heard their voices, yet they’ve become a group of people I look forward to conversing with every day. Their undying passion and creativity has kept ESLint going as I’ve struggled with my health, and while I started ESLint alone, they are undoubtedly the reason it survived long enough to reach its current level of popularity. A huge thanks to Ilya Volodin, Brandon Mills, Gyandeep Singh, Mathias Schreck, Jamund Ferguson, Ian VanSchooten, Toru Nagashima, Burak Yiğit Kaya, and Alberto Rodríguez for all of your hard work. There are a lot of factors that have led to the success of ESLint, and by sharing them, I’m hoping to give others a roadmap for what it takes to create a successful open source project. As with most worthwhile endeavors, a bit of luck coupled with the support of others and a clear vision for what I was trying to accomplish were all key parts of this story. I’m a big believer that if you focus on creating something useful, and you’re willing to put in the hard work, eventually the work will get the recognition it deserves. ESLint is continuing to grow and change, and the team and community are growing and changing as well. I’m very excited to see where ESLint goes next.